The latest issue of The Grapevine is here! Get Debbie’s cleaning tips. Page 6. Learn about the Yelm Food Co-op’s new egg supplier. Page 4. Check out the June / July edition of The Grapevine! 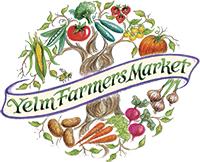 Learn about our produce, how to make an avocado reuben, the art of wine tasting, and much more. Enjoy the April edition of The Grapevine! The latest issue of The Grapevine is out! Click the link below to view it as a pdf. 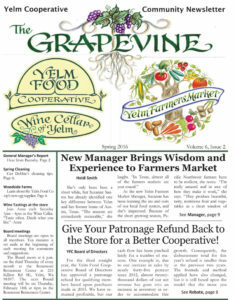 The latest issue of the Yelm Cooperatives Grapevine is out for your reading pleasure! Last issue we talked about reaching $1 million in sales this year and asking for your help. Well, as I post this, we are set to reach that magical goal by mid- December!! when you think you are eating vegan, but might not be! – all perfect for cold winter days! On the back page is a column that addresses a very critical need for your Co-op’s continued success – that is the need for more Working Members to help run the store. You may have noticed recently that there are times when there is only one of 2 people working in the store on a shift. That person has to be cashier, stocker, order receiver, telephone answerer, customer service rep and do anything else that comes up. So, please if you can find the time to lend a hand or know someone who could, talk to one of the staff members. There is not only the satisfaction that comes from serving our local community with high quality, nutritious and yummy foods, Working Members receive some great benefits! Great opportunity for a someone to keep the store shiny and clean! And the cleaner volunteer will get one, too! Both cards will be issued after the volunteer has worked for 3 months. If the volunteer wants to become a Working Member, they will receive those additional benefits as well, like 2o% discounts on purchases, Buy Club privileges and a La Gitana VIP card.